Common Garden Snail (Helix aspersa). 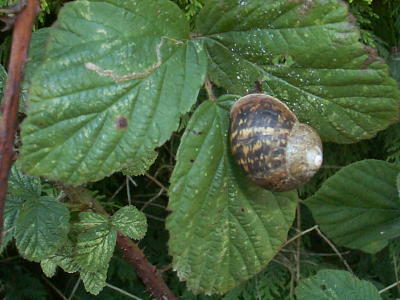 A common snail with a short, shell blunt spire shape, it has no umbilicus. 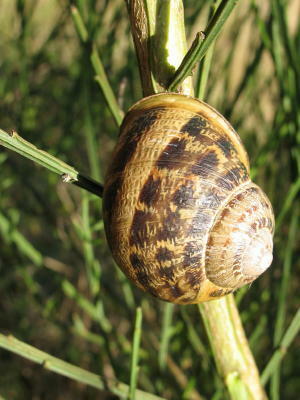 The Colour of the shell is a pale brown or occasionally yellow with broad darker bands and a generally mottled surface. with darker broken spiral bands around the expanding whorls The marbled pattern of garden snails shell is quite distinctive but fades with age. Shell size between 30 - 40 mm , usually only 30mm. Commonly fopund in gardens where they on occasions climb high up on walls. They hibernate, often in large aggregations, cemented to hard surfaces, in similar areas of cover. Include blackbirds ,Song thrush and slow-worms.